Cradle cap is also known as infantile seborrheic dermatitis. It causes flaky, dry skin, or brown or yellowish scaling, on the baby’s scalp. It is most common in the first few months and disappears on its own around 6 – 12 months without any treatment. However in certain cases, it may extend for longer time but you should not worry until and unless it causes itching. 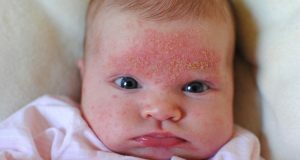 It can also occur on the infant’s eyebrows, eyelids, ears, armpits and other body folds and creases, but is not contagious. The cause of cradle cap is unknown but some researchers believe that it can be caused due to hormones passed from mother to child, extreme weather, food allergies, antibiotics that taken by the mother during pregnancy, fungal growth (malassezia), overstimulation of the baby’s oil glands or growth of yeast in the digestive tract. Make sure to consult a pediatrician if it is spreading. If it is just a mild problem, all you need is gentle massages on your baby’s scalp with your fingers or a soft brush to loosen the flaky scales and then wash with mild baby shampoo. Follow these effective home remedies to treat cradle cap problem naturally without causing any harm to baby soft and tender skin. Olive oil contains many antioxidants that help to cleanse, moisturize and protect the skin. Vitamin A and E in olive oil help to restore the skins elasticity, while the hydroxytyrosol unclogs the pores. Apply olive oil on the baby’s scalp and hair. Rub it gently to spread the oil through the scalp and hair. Leave it for about 10 – 15 minutes without any disturbance. Rub the scalp gently with a comb or washcloth to loosen the crusted skin. Apply warm olive oil to baby scalp at night. Massage gently and leave on overnight. Next day morning use a soft baby brush or any clean cloth to scrub and remove the loose skin. Wash with mild shampoo and warm water. Repeat daily or alternate days regularly. Mineral oil prevents dehydration and acts as great emollient which makes the skin soft. This effectively moisturizes the skin and doesn’t clog skin pores. It also reduces inflammation. Apply mineral oil on the scalp at night time before going to sleep. Cover head with shower cap and leave it on overnight. Wash it off with mild baby shampoo the next morning. Let it on scalp for 2 – 3 hours. Rub baby shampoo gently for a minute or two. Now take a clean, wet washcloth and rub the scalp gently in circular motions. Wash the hair with warm water. Follow 3 – 4 times a week for about 2 – 3 weeks. OR Apply oil on the scalp after a bath. This moisturizes the dry skin and doesn’t cause dryness. This nutritious oil is enriched with vitamin E and many other fatty acids which help to moisturize the skin. These medium chain fatty acids activate the anti-fungal and antimicrobial functions and thereby protecting the scalp from many skin conditions. It is also very safe to use. Apply organic coconut oil onto the babies scalp. Comb the hair to loosen the skin so that it comes out easily. Wash the baby’s hair by using a mild shampoo and warm water. Almond oil is rich in vitamin E, A and D, oleic and linoleic acids. It moisturises the skin and reduces swelling. Its emollient property keeps the skin soft, prevent the dryness and gives relief from irritation and itching. Massage it gently for few minutes and leave for 20 – 30 minutes. Comb the hair gently to discard the flaky dry skin. Wash the scalp and hair with mild shampoo and pat dry. Mix almond oil and tea tree oil in 10:1 ratio. Apply this oil mixture on the head and massage it gently. Use a soft baby brush to get rid of the loosen skin flakes. Rinse off with mild baby shampoo. Repeat this process once daily or on alternative days. Shea butter is a fine moisturizer that has healing properties. This butter contains vitamin A and E which is good for treating various skin conditions like dermatitis, wrinkles, eczema, psoriasis, etc. The oil that has been obtained from this cold pressing of Shea tree seeds, so doesn’t contain any chemicals or preservatives. Apply a sufficient amount of Shea butter on the baby’s scalp. Massage it gently for few minutes and then comb the hair gently. Wash it with mild shampoo and warm water. It moisturizes the affected area and removes the crusts by loosening the oily scales. Most of the people have found that this remedy is one of the simplest and most convenient remedy for treating cradle cap. Apply petroleum jelly to the baby head and scalp. Massage gently and leave for an hour. Use a soft brush on the baby’s head gently for few minutes. Wash the hair and scalp completely with warm water. Regularize this process for several times a week. This scalp oil is prepared by using olive oil as a base. You can use any oil like lavender or rosemary or basil oil which has anti – microbial, anti – inflammatory, soothing, itch relieving properties. Mix 2 cups of olive oil and 5 drops of essential oil (of your choice). Pour in a bottle to store. Apply this oil on baby scalp at night. Wash it with mild shampoo (preferably which has calendula) the next morning. Use a washcloth to rub the scalp gently to remove the crust. Continue this oil application regularly. Squirt some breast milk into a small bowl. Apply on the baby’s scalp at night time. Leave it on for overnight and this will make the thick crusty flakes to become soft. In the next morning, use a soft brush to scrub on the scalp to remove the flakes. Wash the baby’s head with a mild baby shampoo and then warm water. Repeat this process for once a day. Baking soda has antibacterial and exfoliates properties that fight against the dry skin. It balances pH level of the scalp and its alkaline property keeps away all infections. Mix baking soda with enough carrier oil(Olive oil or coconut oil or almond oil) to make a paste. Rinse with a mild shampoo and water. Mix1 teaspoon each of baking soda and water to make a paste. Apply this paste on the scalp and leave for few minutes to dry. Use a soft comb to brush the scalp. Rinse the scalp and hair with mild baby shampoo. Apply this on the scalp, more on the affected area. Sometimes cradle cap is caused due to fungal infection. Tea tree essential oil has terpenoids which have antiseptic and antifungal properties. However it is very strong, so be sure to dilute it first. Mix tea tree oil and any carrier oil (like almond/olive/coconut/jojoba/avocado oil) in 1:10 ratio. Massage it gently on the babies scalp for few minutes andleave for 15 minutes. Wash it with mild baby shampoo. Repeat the same regularly to get rid of the cradle cap. Do not let it get into the baby’s eyes, nose and mouth. Apply this on the infected area of the skin. Massage it gently for few minutes and let it be for 10 minutes. Rinse it off with a mild shampoo and follow this process regularly to get rid of cradle cap. Calendula or marigold contains antiseptic, anti-viral and anti-inflammatory properties which help to give relief from the cradle cap. It is widely used to reduce the inflammation and thus soothes the irritated tissue. It speeds up the healing process by increasing the blood flow to the affected area and improves collagen production. Place the petals of fresh or dried marigold / calendula flower in a jar. Pour virgin olive oil over it to cover the petals. Keep the jar aside for 2 weeks without disturbing. Apply to the affected areas and wait for 40 minutes. Use a fine toothed comb or your fingers to rub gently on the applied area to remove the loosened up dead skin cells. Repeat daily tp clear cradle cap. Apple cider vinegar is rich in acetic acid, malic acid, citric acid and ascorbic acid. It also has an antioxidant and antimicrobial property that fights against various fungal infections. Make sure to dilute it before use. Mix 1 tablespoon of apple cider vinegar with 2 tablespoon of water and stir well. Massage it gently on the scalp for few minutes. Let it sit for about 10 – 15 minutes. If the baby has sensitive skin, use apple cider vinegar and water in 1:4 ratios. Do not let it get into the baby’s eyes due to its acidic properties. Borage oil is a natural seed oil that has been derived from the plant called Borago officinalis. This oil is very rich in essential fatty acid known as Gamma – linolenic acid (GLA), which helps to restore lost skin moisture. Stir equal quantities of both borage leaf juice and water. Apply this on the cradle cap affected area of the skin. Leave it on for few minutes to dry. Rinse the applied area with water thoroughly. Continue this twice a day until the problem is gone. Chamomile is a safe and gentle herb with astringent properties that helps to cure the cradle cap by constricting the overactive glands. Pour hot water over chamomile herb or tea bag in an empty cup. Allow it to steep for ten minutes. Strain and let the solution cool. Apply on the cradle cap affected area of the skin to get soothing effect against the itching. Now apply sany carrier oil like olive, coconut or almond oil. Use a fine toothed comb to remove the itchy, dry patches of the cradle cap. Rub chamomile essential oil on your baby’s cradle cap affected area. Finally wash it off with water and repeat the same regularly. This process is useful when baby has sensitive skin. Add any carrier oil like almond, olive or jojoba oil to chamomile oil. Apply this on the baby’s cradle cap affected area. Apply regularly to reduce cradle crap. In this process, the chamomile and the oats soothes the skin with its anti – pruritic mucopolysaccharides. Place some chamomile and oats in a stocking or muslin cloth and tie it properly. Hang this over a bath tap. Let warm water run through it. Use this chamomile – oats infused water to bathe your baby. Viola is a violet flowering plant that has anti-oxidants, anti – microbial and insecticidal properties. Salicylic acid in viola is disinfectant and softens the hard skin, corns and warts. It is an emollient and contains anti – fungal property. The leaves of this herb contain vitamin C and A and roota contains many minerals, so all parts of the plant contains healing properties. Take 2 to 5 drops of whole plant tincture of viola tricolor (pansy). Give this to your baby daily for about a week or two. But make sure to consult your medical herbalist for knowing the proper dosage as per your baby’s age. Some people may be allergic to viola leaves and it can also lead to nervousness, stomach upset, breathing irregularities, high blood pressure, etc. So, it would be best to follow this remedy under expert supervision only to get rid of the side effects and also to know the correct time and dosage. Burdock root acts in a similar way to chamomile. It contains a natural astringent property that constricts the glands and thus slows down the glandular secretion. Clean a fresh burdock root by scraping using a rough edge of the knife. For younger burdock roots, you have to just wipe with a clean cloth. Add to 3 cups of water and bring to the boil. Lower the heat and simmer it for 30 minutes. Turn off the heat and allow it to steep for few minutes till it gets cool down completely. Finally use this tea to wash baby scalp to get prevent the cradle cap. Leave it like that without washing with water. Steep 1 table spoon of dried burdock root in a cup of hot water for 15 minutes. For this, you have to use three herbs called viola, red clover and burdock. Red clover contains eugenol, myricetin and salicylic acid which have anti – inflammatory properties that helps to cure the inflammation. It is rich in various nutrients like calcium, chromium, thiamine, magnesium, potassium, niacin, phosphorus and vitamin C.
Place a cup of dried red clover herb in a quart jar. Fill the jar with boiling water and cover. Leave for 5 – 10 hours and strain to get the red clover infusion. Stir together viola leaves, red clover infusion and burdock seeds in 2:2:1 ratio. Steep for 15 – 30 minutes before straining. Use this to rinse the baby’s scalp, hair and other cradle cap affected areas. Leave scalp without rinsing off. Repeat this same process daily to get rid of cradle cap. Wash baby head daily with mild shampoo followed by warm water to get complete relief from the cradle cap. It loosens the dry flakes without any irritation. Wash baby scalp with warm water. Rub mild baby shampoo gently on the scalp and head thoroughly. Leave for 2 minutes and then scrub the scalp with soft bristled baby brush. Rinse and then pat dry the scalp gently. Continue this process once daily for the first week and then follow this twice weekly. Here are some simple and effective tips to get rid of your baby’s cradle cap problem. Avoid excessive pressure on baby skin while combing or brushing to remove the flakes and scales. Use fine toothed soft comb. Do not use tweezers or any other sharp tools to remove the scales and flakes. Use humidifier at home so the skin does not get too dry. Note down baby diet to rule out the possibility of getting cradle cap as a result of food allergy. After treating cradle cap wash baby hair daily with a mild shampoo for few days and brush wet hair with a clean, soft brush to remove remaining flakes or scales on the scalp. Moisturizing baby scalp after bath / shower to prevent from dry and scaly. Rinse affected area properly to remove all the traces of soap or shampoo that applied on that area. Apply just a pea – size hydrocortisone cream on the cradle cap affected parts of the skin in the morning, but not all over the head. Consult your doctor before going to use any medicated or dandruff shampoo for preventing the cradle cap. If the infection is severe and spreading to other parts immediately seek medical advice. All these remedies are natural and safe for your kids to treat the cradle cap. But be patient as some of them can take time. Please share any experience with us. Calendula is also known as pot marigold but is completely different from the marigold most people have in his/her garden. So if using for cradle cap make sure your using calendula. I made a salve out of calendula and vaseline. It can be used for various skin conditions as well as cradle cap. (apply to cuts, toenail fungus, ingrown nails). Calendula is the premier herb for skin care. Can I use egg massage then shpoo my baby hairs with baby shampoo. actually there is no harm in applying egg. But personally we feel that your baby’s scalp may be too sensitive for any masks or packs. It is good to start once he reaches 2 years of age. Which helps relieve itching associated with cradle cap? And which is safe for open skin/small wounds from scratching?